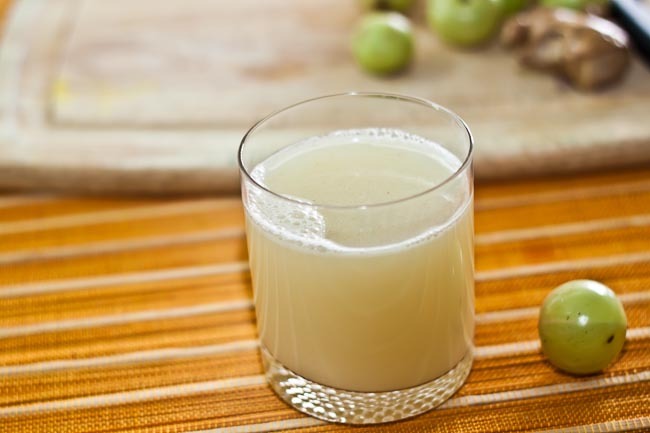 Gooseberry Ginger Juice is a perfect health drink that provides a great amount of health benefits to the human system. So drink the perfect detox juice as a mid-morning snack, and you will feel energized and refreshed. The Indian gooseberry, also known by its Hindi name ‘amla,’ is rich in antioxidants, improve gastrointestinal health, treat diabetes, and has many more health benefits. Did you know: Amla is known for its high Vitamin C content. Amla enhances food absorption, balances stomach acid, fortifies the liver, nourishes the brain and mental functioning. It also supports the heart functioning, strengthens the lungs, increases skin health and acts as a body coolant. Amla is a full of antioxidant as well. Serve Gooseberry Ginger Detox Health Drink Recipe on ts own as a mid morning snack.